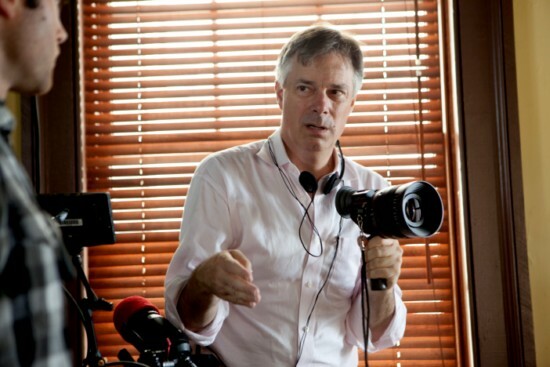 Whit Stillman wanted to helm an adaptation of Anchee Min’s Maoist memoir, Red Azalea , as his next project after his 1998 film, The Last Days of Disco . But, he told us, he was pushed out of the project when Oliver Stone wanted in. Stillman says he was ready to extend an option to the book for $140,000, but the deal mysteriously collapsed when Stone showed interest. Stillman’s option lapsed, and Stone wound up dropping the film when he realized it couldn’t be shot in China. I don’t think we’d previously heard that Oliver Stone was the reason Stillman dropped Red Azalea . Stillman reveals that the movie, including post-production, cost around $1.5 million, which I think is new to us, and that it’s gradually opening up on to more screens and is likely to keep screening over the summer. There are a lot of big words in his movies that some people might not understand, I tell Stillman. Like what, he asks? I check the notes I made while watching the film: “foreboding,” “incumbent upon,” “immutable,” “incalculable.” As the list goes on, Stillman looks a bit out. “Those aren’t big words to me,” he finally says. Well, quite. The Gazette also has a page of quotes from Stillman’s movies if you want some light relief. 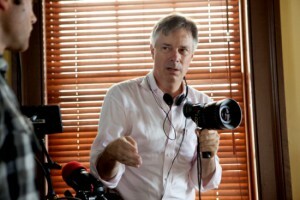 PJ Media have an audio interview with Stillman by Ed Driscoll. I haven’t listened to the whole ten minutes, but he does say that Criterion are talking to Warners about making Barcelona available for release on DVD or Blu-Ray. But I’m staying away from books now. Original stories all the way. I’m also thinking about not accept script commissions anymore. Try to write the script myself, don’t sell it. At the Telegraph in the UK, David Gritten interviews Stillman although by this point I don’t think there’s anything here that we haven’t read before. The same goes for Charles Ealy’s interview at Austin360 and Miles Fielder’s at The List. Despite the tony airs and sophisticated palette of his pictures, Stillman remains a thoroughly accessible, friendly and chatty fellow, completely devoid of any airs or pretension. “I find arrogance so offensive,” he says. “There’s a filmmaker who made a film last year that I loved. I saw him at one of these luncheons where they’re trying to get people votes for the Oscars. I went up to him and said hi, and he was so rude and full of himself. I was going to vote for his movie after the lunch, and then I thought ‘You know? He’s such a stuck-up guy, and he’s going to get nominated anyway. I just won’t bother.’ And I didn’t. Moore: You’ve used a lot of the same actors in some of your movies. Do you feel like there are any from Damsels that you’ll use again? Stillman: I love them. Absolutely. A whole bunch from this film. There’s many actors in this film I’d like to work with again. I’m already trying to think of shaping this script that I have where they could work – because, and that’s one of the exciting things – when you’re still working on a script, you can still shape it for performers. And I really like to do that. So Greta and Adam would be the leads and then there are other people that I would like to bring back. Moore: So that’s a technique that you’ve used a lot? Stillman: It helped me with Barcelona because I already had the idea for Barcelona before I started working on the script about the two cousins in Barcelona, and then I met Taylor Nichols and Chris Eigeman shooting Metropolitan , and saw how well they got on together and that became the basis of Barcelona . Moore: Do you use Twitter or anything like that? Stillman: I don’t use Twitter. I’ve had to take down two imposters who weren’t good imposters. If they’d been funny it would have been ok, but they weren’t funny at all. And so I still won’t do Twitter so that I’m not imposted. Stillman: The first two-thirds of this film is in the mode of my other films; the last third is a cartoon. All the people who played those parts—the dumb frat boys—knew exactly how to play them when they came in and read. Ryan Metcalf, who plays Frank, said, “I’m thinking of something that’s rather broad. Do you want to see it?” I said, “Yeah, show me ‘rather broad.’” And he knocked it out of the park. Then Billy Magnessun, who ended up playing Thor, came in, and he was bouncing off the walls. That’s all the interviews for the moment.